Here's a chunk of code that will create a simple menu with a header(Test Menu), 4 items (A,B,C, and Quit), and allow the user to select an item. All the other optional stuff will be added later. Hopefully from the code you'll be able to understand the general flow. First, the program runs menuStart, which displays the menu header and items to the display with the sub-routines dispHeader and dispItem. Once the menu has been displayed, wait for a user input. For a simple menu, this isn't too bad. However, it's bland, and void of features. So, let's add some features. To give the user some convenience, we'll add a cursor. The cursor allows the user to input up or down and use enter to select an item besides just pressing the corresponding number. What happens if the user presses up/down/enter? We'll need to add code to deal with the new key presses. Instead of only having the choice up and down, why not categorize items and then display the categories left to right? An example of this is the OS's math menu. 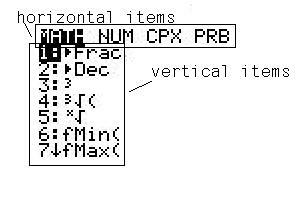 The code for 2 dimensional menus is much more complicated than the standard 1 dimensional menu, but is still manageable for the calculator. Not only do you have to keep track of which item is currently highlighted, you also need to keep track of which group that item is part of. Since there are enough differences between the code for a 1 dimensional and 2 dimensional menu, I'll post the code in it's entirety. Be aware that it's a lot longer. This menu has 4 items in each group, with 3 groups. What if you have more items than will fit in one screen? A solution to this is to display items on the screen and then when the user scrolls past the limits of the screen, it will "move" the items up and display the other items that wouldn't fit. There are so many variations of a menu interface that showing them all would be impractical and impossible. Use your imagination and come up with variations, like displaying pictures in the background, having a custom cursor, or anything else you can think of.